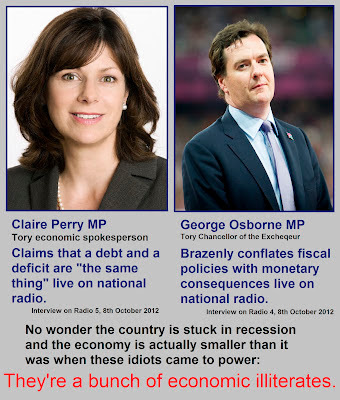 On the 8th of October 2012 the Tory party kicked off their conference with two breathtaking displays of economic illiteracy on national radio. Victoria Derbyshire: "What is puzzling is, under Labour debt equals bad, under the Conservatives and Liberal Democrats national debt equals?" 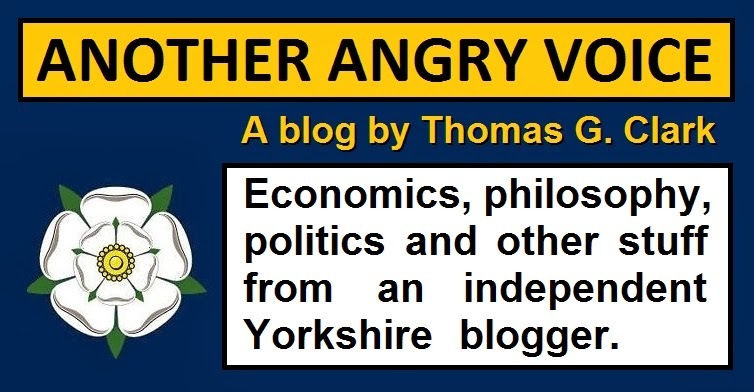 Claire Perry: "We have cut Labour’s deficit Victoria by a quarter"
Derbyshire: "I’m talking about debt"
Perry: "Well it is the same thing"
Derbyshire: "It is not the same thing!" What makes this confusion all the more shocking is that Perry is a former banker who worked for Bank of America and Credit Suisse. A banker getting confused between the concept of debts and deficits is equivalent to a physicist getting confused between the concepts of speed and acceleration! It suddenly seems no surprise at all that the world has been engulfed by a gigantic financial crisis, if banks have been employing people so economically clueless that they are incapable of differentiating between two such fundamental economic concepts. It is also no surprise that the crisis has dragged on for so long if the political classes are also incapable of making such simple economic distinctions. Aside from the fact that this seemingly economically illiterate woman has spent a long career in banking and business, another surprising fact is that she also worked as an advisor to the Tory party chief strategist and current Chancellor of the Exchequer, George Osborne. A man who just happens to be the other Tory to have brazenly displayed his economic illiteracy on national radio that same morning. Osborne's crime against economic coherence is one that he has repeated time and again. It is the simplistic justification narrative that the record low cost of government borrowing is directly caused by market "confidence" in his ideologically driven and economically destructive austerity experiment. here's exactly what he said. "Our policy has got the deficit down by 25%, it is every single day delivering in the World bond markets record low interest rates for this country, which shows that it has credibility." I've already written a long article outlining exactly how fallacious this argument is (which you can read here) however for the purposes of this article I'll summarise some of the main points. 1. Yields are extremely low because of high demand for "safe" investments like government bonds in times of economic crisis. If the market had confidence that Osborne's fiscal policies could stimulate economic growth they would be investing in the wider economy in the expectation of growth, not in extremely low interest government debt. The fear of excessive risk elsewhere in the system is driving investors to mothball their wealth in safe but unprofitable government debt. 2. There is quite obviously more correlation between all time low bond yields and the Bank of England's "unprecedented" monetary policies than Osborne's fiscal policies which are only unprecedented in the scale and longevity of the catastrophic economic consequences. 3. Countries that like the UK have held interest rates at near zero and created vast amounts of quantitative easing cash (Japan, USA) have also experienced repeated record lows in state borrowing costs. 4. Other countries implementing similar austerity policies to "Osbornomics" (Spain, Italy, Portugal, Greece) - but not creating quantitative easing windfalls due to lack of monetary autonomy - are suffering recessions like the UK, but also facing unsustainably high borrowing costs. 5. Countries that have been largely avoiding such drastic "cut now, think later" austerity measures are benefiting from similarly low borrowing costs to the UK (USA, Finland, Germany). All in all a powerful demonstration that Osborne is talking economic gibberish. There are obviously two potential reasons for this, he is either economically illiterate and doesn't even realise that he's talking bobbins, or he knows exactly how disingenuous it is to conflate fiscal policy with monetary consequences, but he has such contempt for the British people that he believes he can just "get away with" creating such a misleading economic justification narrative. Given the fact that Osborne has no economic qualifications and one of his former advisers doesn't seem to understand the difference between a deficit and a debt, it seems entirely plausible that he is actually so economically illiterate that he actually believes his own pitiful justification narrative. On the other hand, his party have such a long record of dishonesty and contempt for ordinary working "plebs", it is also entirely possible that he knows exactly how disingenuous he is being every time he repeats his absurd "market confidence" story. 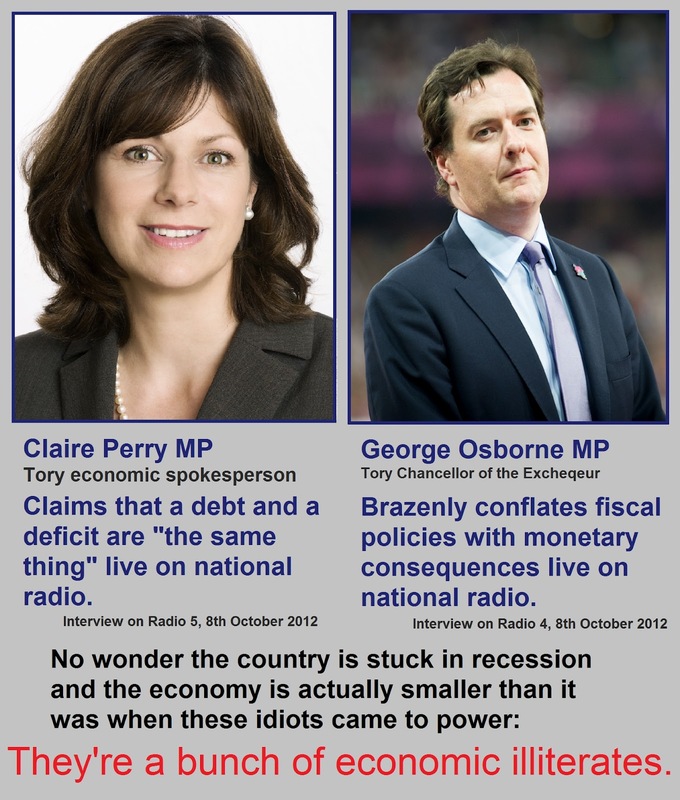 Whatever the case, these two examples of Tory economic illiteracy on the same day clearly demonstrate that the Tory party is full of people that either don't understand basic economic theories, or are prepared to talk absolute nonsense in the expectation that the general public are so economically illiterate that they wont get called up for spreading such abject gibberish. It is quite remarkable that the Tories still manage to posture themselves as the most trustworthy party in economic matters, when their economic strategy has been such a disaster (the UK economy is actually smaller now than it was when the Tories came to power despite £200 billion in QE cash during the period) and they feel free to openly demonstrate their economic illiteracy on national radio. The catastrophic failure of "Osbornomics"